"In a July 2018 survey from Waterstone Group, 84 percent of people underestimated their spending on subscriptions—with roughly half off by $100 or more. All told, the average consumer spends $237.33 each month on subscriptions." Welcome to Day 3 of our 30-Day Easy Money Makeover! Every day in April, we're bringing you strategies to help you improve, and feel more confident about, your money situation. Follow along and see the rest of the calendar here. When Apple CEO Tim Cook speaks, people listen. And during Apple’s recent March event, Cook made it clear that the company is focused on incorporating a new dynamic into its business model: subscriptions. Apple TV+, Apple News+, and Apple Arcade, all announced at the event, are subscription services that the company is betting will help it extract more revenue from users. The reason businesses such as Apple like subscriptions is the same reason you should be regularly reviewing yours: Once you’re subscribed, that recurring charge can easily become background noise. You don’t realize how much you’re shelling out. Or that you’re still subscribed to something you no longer use. “I found out that I was paying for a security system on a home that I had already moved out of,” says Haroon Mokhtarzada, cofounder and CEO of financial management app Truebill. In a July 2018 survey from Waterstone Group, 84 percent of people underestimated their spending on subscriptions—with roughly half off by $100 or more. 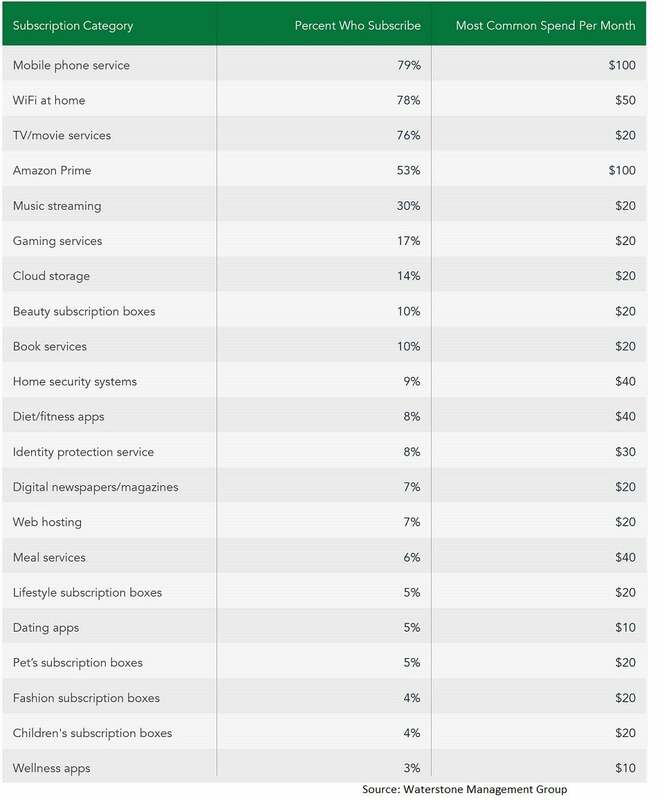 Researchers looked at the monthly budgets of 2,500 consumers for 21 categories of subscription services. All told, the average consumer spends $237.33 each month on subscriptions, they found. Many are household necessities—or at least, legacy costs—such as cellphone bills, cable TV subscriptions, and internet service. But that’s just a start. Then there are the music streaming services. Cloud storage. Home security systems. Meal kits. Dating apps. Pet subscription boxes. And the list goes on. Odds are, you can probably find a subscription or two to drop and save some money every month. But how do you go about doing it? Option 2: Look for a service that will negotiate bills and cancel subscriptions on your behalf. Some companies let users connect their financial accounts, and have an algorithm do the work of identifying recurring expenses and offering ways to cancel or discontinue them. Whether you DIY or call in help, nixing a subscription or two can result in hundreds of dollars in savings over the course of a year.